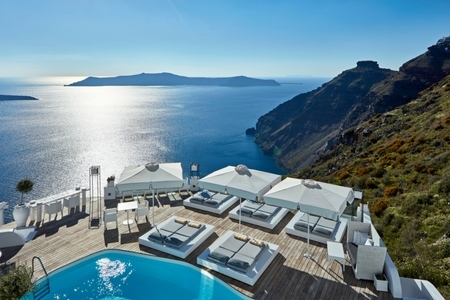 This romantic, higgeldy-piggeldy, clifftop delight is situated just a 15-minute stroll from the party town of Fira. Not for the faint-hearted, Sunrocks has a serious amount of steps and no lift, but it’s worth the climb. 18 rooms and suites benefit from cool, minimalist interiors and private balconies with direct sunset views (many with private jacuzzis and/or pools, too). A chilled glass of wine while you watch a red-hot sun slipping under the sea is a must.